A baby born four months early has been taken home by her parents after surviving pioneering surgery. 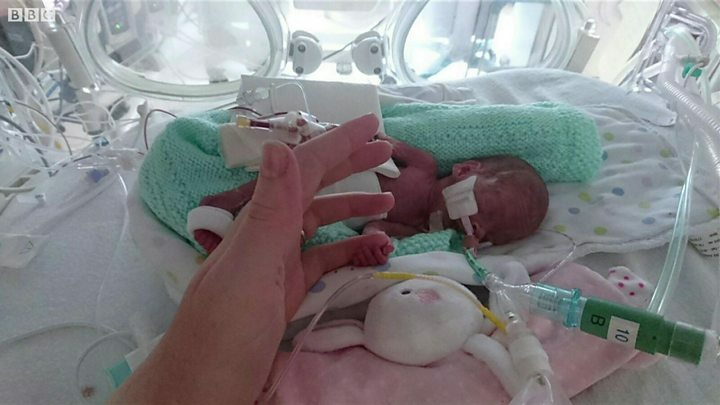 Abiageal Peters was born at 23 weeks, weighing just over 1lb and suffering from a ruptured intestine. She became the youngest patient ever to be operated on at St George's Hospital, Tooting. After four months recovering on the neo-natal ward, Abiageal is now back at home in Esher, Surrey, with parents David and Louise. After her sudden birth Abiageal's stomach turned black and her survival was touch-and-go. Mrs Peters said: "It was like a crash. It was suddenly, 'oh no, she has to go through this'. "It was like, 'ok she may not survive with surgery - but she definitely won't survive without it'. So we signed on the dotted line and waited. "We were allowed a quick peek and a kiss before she was rushed off. It was incredibly scary and hard to believe something that small could survive." St George's is one of the leading hospitals for for paediatric surgery in the country, but it was still a first for surgical staff to operate on a baby so young. Paediatric surgeon Zahid Mukhtar said: "Her skin and tissues were very jelly-like. If you held them she would start to bleed and, if you can imagine, a baby that size has very little circulating blood volume, so you can't really afford any blood loss. "But this great team of about 10 people were focusing all their energy on this tiny little baby." Now Abiageal is finally out of danger and flourishing at home with her family, including older sister Tara, two. Mrs Peters added: "She's doing brilliantly. We've been told to treat her like a normal newborn; she's not on any monitors or oxygen or anything. But you're still kind of, 'is she breathing?' and just making sure she's OK all the time. The reason for the early labour is unknown. Mr Peters said: "Now she's home it's great, you know. She's had a lot of hurdles in her short life but she seems to have passed through it all with flying colours."